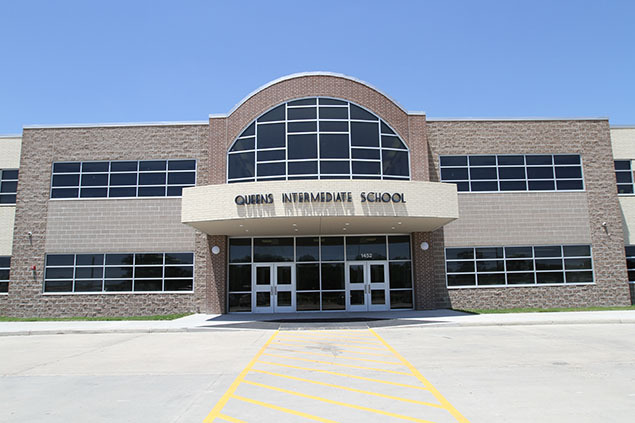 Queens Intermediate School holds official grand opening of the new state-of-the-art campus. Scroll below to view photos of the new and old campus. (Left to right) DeeAnn Powell, deputy superintendent; Mariselle Quijano-Lerma, board president; Dr. Kirk Lewis, superintendent of schools; and Troy Jones, Queens Intermediate principal are all smiles while cutting the ribbon in the cafeteria. Queens Intermediate School has been open since spring 2014 to staff and students and Thursday, Sept. 18 marked the official grand opening of the new state-of-the-art campus. The school held an open house and ribbon cutting ceremony in conjunction with the campus open house to mark the special occasion with parents, staff and community. Students took special guests on a guided tour of the facility before the program commenced. Guests were noticeably impressed by the young tour guides who were knowledgeable of the building’s features. They were also impressed with the school’s sleek design. The classroom seating provides a colorful assortment of the school’s colors – blue and orange – and were designed to comfortably fit the contours of the vertebrate. Additionally, Queens Intermediate now has two gyms, one of which features a painted mural of the mascot in the center of the wall. The bleachers sit directly across from the mural and offer enough seating for the student body and more. The cafeteria has been effectively designed to accommodate students and staff to meet educational and programmatic needs. Despite heavy rainfall throughout the evening, there was barely an empty seat in the cafeteria during the ceremony. Queens Intermediate hosted everyone from the Board of Trustees and former board member Jerry Ross Spear, to the Superintendent of Schools Dr. Kirk Lewis, district administration, school staff and even Future Facilities Committee member Charles Davis, who was part of a community group that suggested the school be built during the 2011 bond election. 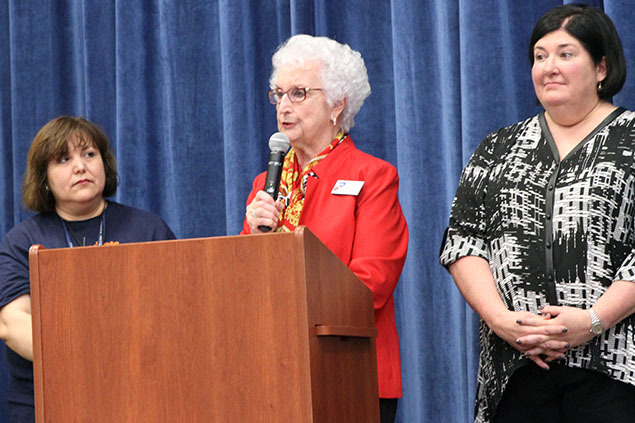 The school’s Principal Troy Jones and Board of Trustees member Nelda Sullivan, each expressed warm sentiments about the finished campus and its significance to the community. Sullivan, a long-time resident of the Queens community, was instrumental in bringing the project to fruition. The campus has been designed to meet the needs of the 21st century student. The two-story building provides wireless Internet access so students can take “ownership of their learning” through the district’s one-to-one technology initiative. Pictured: Nelda R. Sullivan, board member and Troy Jones (right), principal at Queens Intermediate. For more photos from the ribbon-cutting ceremony, please click here. This student learning station overlooks the entrance in the front of the building. Front entrane of the first building.